iBird Purple Women's American Apparel Fine Jersey Short Sleeve T-Shirt: Back to basics never looked better. This best-selling women's tee by American Apparel is a versatile must-have for every lady's wardrobe. Wear it to work or play, or dress it up with a blazer or sweater and wear it out to dinner. Super soft, lightweight, and perfect for screen printing. Check out other products with this design or view all apparel. 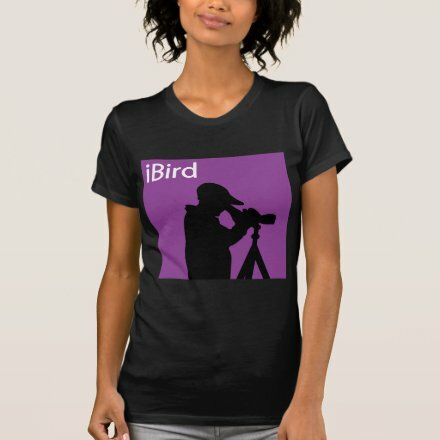 This t-shirt with our iBird Purple design is made-to-order by Zazzle.com. Zazzle offers 100% money back guarantee on our high quality Cute Union products. In case you are not happy with your purchase, you can always return your t-shirt for an exchange or refund within 30 days of receipt. See customer service for more information.